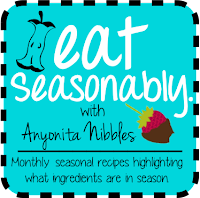 In an effort to save money grocery shopping and to highlight the importance of eating with seasons, I've decided to launch a new series called "Eat Seasonably." Each month, I'll feature unique recipes for seasonal produce. Okay, here we go, eating seasonably, getting the most out of our produce and saving money! For the smoothie, begin by pouring the milk into your blender. Next, add the florets, banana, cherries and yogurt. Drizzle over the honey and blitz until smooth and frothy. I want to try the smoothie. I love cherry drinks and cherry blossoms ( as you could tell from my post on them) A smoothie is so refreshing and spring like! Oh, definitely try it, Marie! I was so surprised that I couldn't really taste the cauliflower. I gave some to my son, sneaky way to get his 5-a-day in! This smoothie looks so cool! 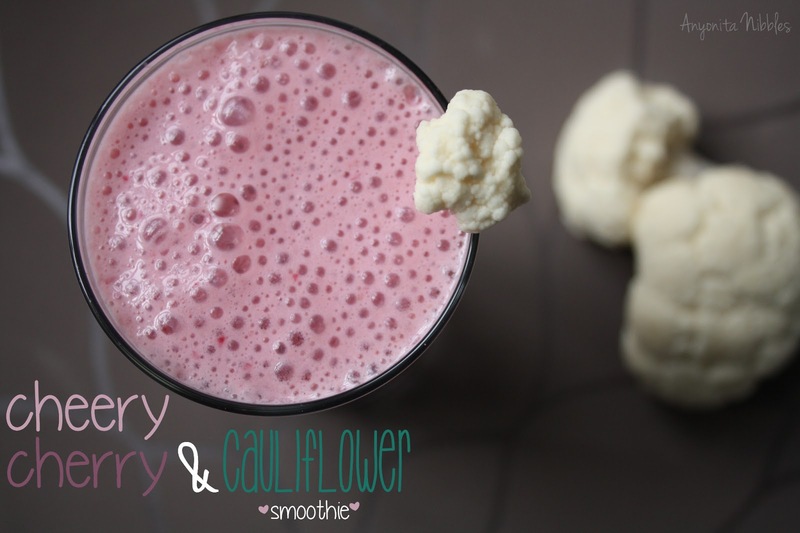 I've never thought about putting cauliflower into one but I bet it totally helps thicken it up (plus adds veggies) Definitely going to try! that is a true mystery ingredient! Sounds very refreshing.....Thank you for sharing with the Clever Chicks Blog Hop this week; I hope you’ll join us again! 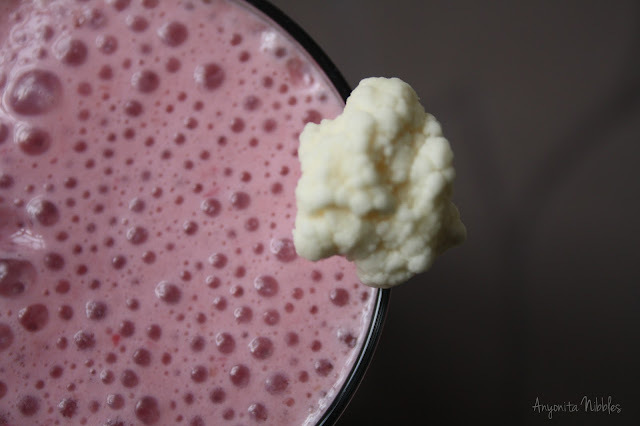 I love cauliflower, but had not thought to add it to my smoothies. Earlier this week I made a cherry, banana and spinach smoothie. Now I have to try cauliflower!! I'm visiting from Just Us Four. Do you sweeten your smoothies? If so, with what? Oh I seriously want to try this smoothie!! 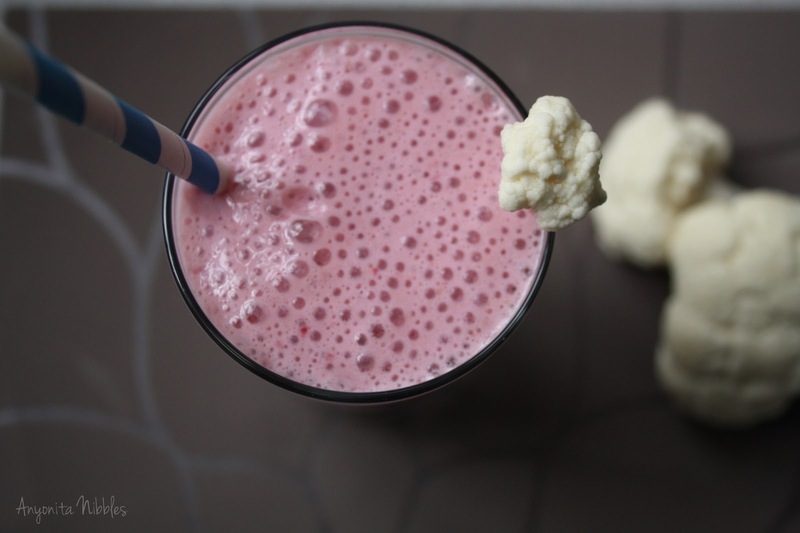 Can you taste the cauliflower in it?? How cool! I love fun new recipes like these! I'm following you now and love your blog! Come visit me if you get a chance! Hope you're having a great weekend! There are so many different ways of making a smoothie utterly healthy and tasty at the same time. Love this. Thanks so much for linking up to Inspire Me Wednesday, Anyonita! I know! It's great that you can sneak in the healthy stuff and mask it with sweet cherry, isn't it? I've been giving Callum (my son) smoothies every time I have one to boost his veggies! :) Sneaky, sneaky, but it works! Aw thank you for the follow! I'm following you via GFC as well & I can't wait for Thursday to get in on that Pinning Party action! :) Sounds lovely! The crostini looks lovely - not sure about the smoothie though, don't like them at the best of times! I found the crostini to be too cauliflowery for me! Haha but my husband & son loved it! On my way to your blog! Oh my goodness! Your blog is awesome! I'm a new follower through Twitter & Pinterest.